These substances, patented by CNRS, block a chain of molecular reactions known as the Hedgehog signaling pathway, the disruption of which could be involved in several cancers. These compounds could become new medicines in the long term. In the short term, they should prove to be precious tools in elucidating the role of the Hedgehog pathway in the development of these tumors and their resistance to treatment. This work, carried out in collaboration with the Laboratoire d’Innovations Thérapeutiques (CNRS / Université de Strasbourg), is published in the Journal of Medicinal Chemistry. The Hedgehog signaling pathway is a cascade of complex biochemical reactions. Very active during embryogenesis, it participates in cell proliferation and differentiation, as well as in the development of numerous tissues. In adults, it plays a key role, particularly in maintaining stem cells in the brain. The disruption of this pathway could participate in the development of many cancers, especially very aggressive brain tumors in children. Malfunctions affecting the Hedgehog pathway can be caused by mutations of a membrane receptor known as Smoothened, an essential link permitting the activation of the Hedgehog pathway. Several pharmaceutical laboratories have developed compounds capable of blocking Smoothened. Thanks to these receptor antagonistic compounds(2), they have succeeded in stopping the development of certain tumors. However, experiments conducted on animal models and in humans demonstrate the onset of resistance to these treatments. New mutations of Smoothened in the tumoral cells annihilate the effects of the antagonists responsible for inactivating it. For this reason, it is important to find new antagonists and to better understand the mechanisms underlying this type of resistance. 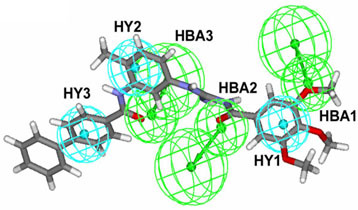 In order to discover new Smoothened antagonists, the team of researchers coordinated by Martial Ruat adopted a novel strategy, namely the virtual screening of computerized molecular databases. Among the 500,000 or so molecules included in these databases, they searched for those whose structure could produce the same effect as molecules already known to inhibit Smoothened. The scientists selected one molecule out of about 20 candidates. By slightly modifying its structure in order to optimize it, they discovered a family of compounds known as MRT and tested their biological activity on cultured mouse cells. The team discovered that MRT compounds, and more particularly acylguanidine MRT83, block the proliferation of cells suspected of causing brain tumors. In addition, these new compounds inhibit Smoothened with an activity similar to or exceeding that of already known compounds. Several years of tests will be necessary before promising new substances such as MRT compounds can be marketed as medicines. Nevertheless, their properties could shed new light on the functioning, the three dimensional structure and the location of Smoothened receptors. These MRT compounds could contribute to understanding the cause of tumor resistance. This study could lead to the discovery of new targets and therapeutic strategies for combating certain cancers. Model of MRT83 compound, Smoothened antagonist. 2 – An antagonist is a substance which, in attaching itself to the same cell receptors as another substance, prevents all or part of the effects normally produced by the cell. Here the antagonists have an “opposite” effect to that of the “mutated” receptor. Acylthiourea, Acylurea and Acylguanidine Derivatives with potent Hedgehog inhibiting Activity. Antonio Solinas, Hélène Faure, Hermine Roudaut, Elisabeth Traiffort, Angèle Schoenfelder, André Mann, Fabrizio Manetti, Maurizio Taddei and Martial Ruat. Journal of Medicinal Chemistry. 23 February 2012.